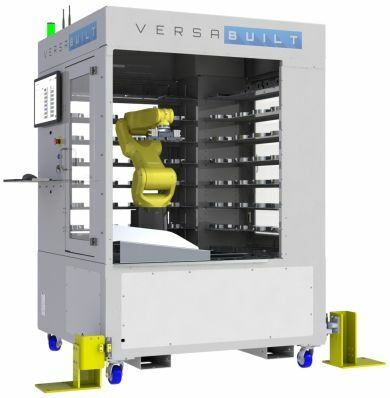 VersaBuilt Robotics, a Boise-based robotics technology company, announces availability of the VersaBuilt VBX-160 automation solution with the FANUC LR Mate 200iD7L. With a 7 kg (14.4 lbs.) payload and a 717 mm (28.2 inch) reach, the LR Mate 200iD7L brings a new level of performance and reliability to the VBX-160. "We are thrilled to offer a FANUC robot in our VBX-160 CNC automation solution," says VersaBuilt Robotics' CEO and founder Al Youngwerth. "FANUC is world renowned for their reliable robots and exceptional support and service." The VersaBuilt VBX 160 represents a new category of machine tending products. It requires no robot programming, no robot teach pendant, no custom robot grippers and no special training. Designed for high part mix manufacturing environments, the VBX 160 can automatically tend virtually any part shape thanks to our patent-pending MultiGrip jaws. The VBX 160 is the ultimate automation solution for all of your CNC tending needs.